This PDF is a companion for the video tutorial above. Download the PDF to follow along and take notes as you watch. Removing a color, often referred to as chroma keying, is most often used to superimpose a subject onto a background. It can be difficult to execute this effect well, but with a little instruction Remove a Color makes achieving this effect quick and painless. Avoid the use of reflective props, jewelry, clothing, or other reflective surfaces, as they will disappear if they reflect the color being removed. 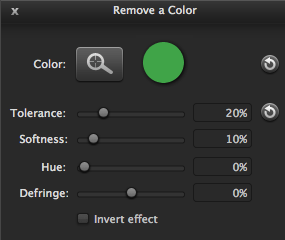 Make sure your subject isn’t wearing the color you will be removing. Record using the highest resolution possible. Preview or do a quick screen test before a long recording. First, import your recording and your desired background image or video clip by going to File > Import Media, or by using the hotkey Command-I. After you've adjusted your canvas to your desired video dimensions and saved a version of your project, click and drag your recording from the media bin onto the canvas. Use the Crop button to remove any unnecessary space on either side of your subject. Click on the Video FX button and drag Remove a Color to the recording on the timeline. Open the FX Drawer (shown below) and click on the effect. If your properties panel is not already open, open it by clicking on the Properties button. Click on the color picker in the properties panel and move your mouse over to your canvas. Select the color you want to remove from the clip. The color should mostly be removed at this point with maybe just an outline around your subject remaining. If you are unhappy with the amount of color left behind, try selecting the color again in a different spot on the canvas. Use the slide controls to fine tune your effect. Finally, once you've finished editing the effect, click and drag your desired image or video background directly above or underneath this clip on the timeline. Play back the clip to preview your work. To make more adjustments, go back to step 4.